Our Miniature Dachshunds are part of our Family and Share our Home as well as our Hearts and are raised in the home, with lots of love. They are very well socialized. Our puppies are quality pets, Not pet quality. 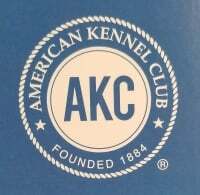 We do offer full AKC open papers for Breeding or Show, at a slightly higher price. We specialize in Smooth Coats & Long Hair Miniature Dachshunds. 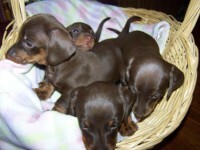 We have Black & Tan, Brindle & Dapple Smooth Coats as well as Shaded Red, English Cream Long Hairs. All of our Miniature Dachshund Puppies come with a one year Health Guarantee against Life Threatening Illnesses. All of our Miniature Dachshund puppies will be Vet checked and will have age appropriate vaccinations and worming. We require a non refundable deposit of $100 to hold a Miniature Dachshund Puppy until he/she is about 8 weeks old.